All things must pass. But that does not mean they have to be destroyed only a few decades after they were created. 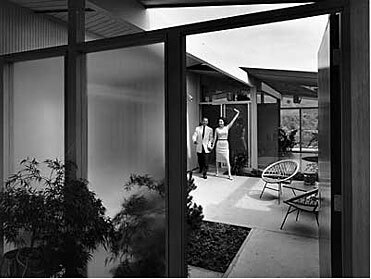 Increasingly, the houses that Eichler built are being torn down or radically remodeled in ways that leave no trace of their architectural heritage. It is true that the Eichler subdivisions were "tract" housing built to sell to a middle-class market. 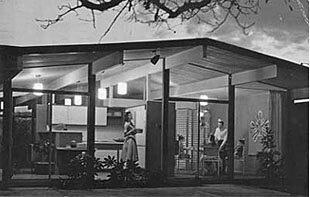 However, that does not diminish the fact that Eichler homes were designed by world-class architects and were a bold, unique experiment designed to bring modern style to the mass housing market. In recognition of this, in 2005 two Bay Area Eichler subdivisions, Green Gables and Greenmeadow, were placed on the National Register of Historic Places, the Nation's official list of cultural resources worthy of preservation. The National Register is part of a national program to coordinate and support public and private efforts to identify, evaluate, and protect our historic resources. Read more about the Eichler nominations. Local Eichler preservation movements have made progress in the last several years. In Cupertino, the city adopted a set of Eichler-specific guidelines to advise homeowners on remodels, though it has proved to be a battle against local development interests to maintain them. In Palo Alto, a number of neighborhoods have banned second-story additions, believing that they negatively alter the character of their neighborhoods. Eichler owners in Lucas Valley (San Rafael) and Greenmeadow (Palo Alto) have active architectural review committees that guide homeowners in remodeling their homes so that the Eichler style is preserved.